1920-1929, United States, "1920s America"
Over his lifetime, George Bellows executed several portraits of his wife, Emma. The painting Emma in a Purple Dress (1956.58) was his last, and the one that took the longest. He spent several years working and reworking the painting, only finishing in 1923, three years after this preliminary drawing was done. 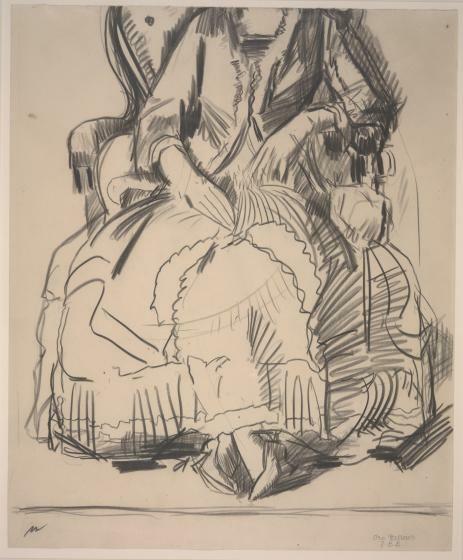 Though the basic composition—the dress and position of the body—remained the same, this drawing shows how easily he defined the luxurious dress, which forms such an important part of the rich, painterly impression made by the oil painting. 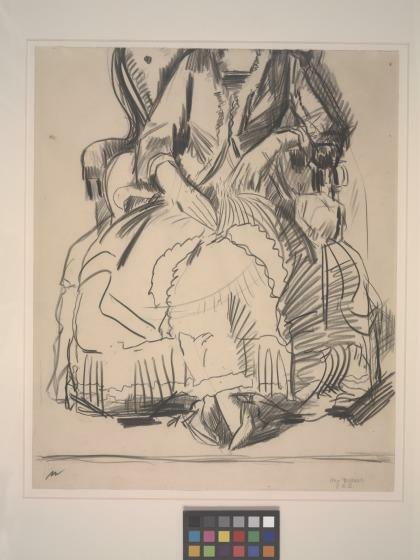 It was the head and expression which Bellows continued to work and rework on the large canvas, and here he avoided the dilemma by placing the figure so the paper ends at her neck. William Keyse Rudolph, DMA Label copy (1960.124), July 2005. Anne R. Bromberg, "Dallas Museum of Art, Selected Works," (Dallas, TX: Dallas Museum of Art, 1983), 204. Emma was thirty-nine and the mother of two girls when Bellows completed his final portrait of his wife, Emma in a Purple Dress (1956.58). Bellows met Emma, who is reported to have been an attractive, spirited woman of strong character, in 1905, and they were married in 1910. The pair met while enrolled in a class taught by Robert Henri at the New York School of Art (formerly the Chase School of Art, named for its founder, William Merritt Chase).